While it’s not one of the best-known skiing destinations in Europe, Trentino is home to some resorts that really ought to be on your must-visit list. It has over 800 kilometres of impeccably groomed slopes that roll down the soaring cliffs, year-round sun, and a smattering of five-star accommodation. As well as chocolate-box towns and the glory of traditional Italian cuisine, there are areas to suit all skiing abilities, alongside spectacular scenery you can capture on camera to keep forever. Here’s our pick of the top three resorts in Trentino. At the foot of the Brenta Dolomites, the Paganella Alpine Plateau is one of the best loved resorts for mountain enthusiasts. 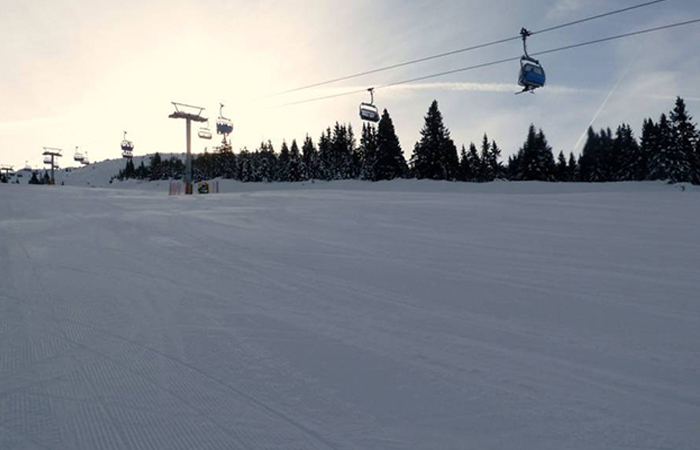 Skiers and snowboarders looking for exciting descents, tree-skiing and impressive snow parks will love exploring here. While intermediate and advanced skiers can enjoy the 1,100 metres of vertical drops and tree runs, beginners and families are well catered for too, with four ski schools to choose between and dedicated learning slopes. Immersed in the Adamello Brenta Nature Park, the largest protected area in Trentino, nature fans will find the magnificent scenery here breathtaking. 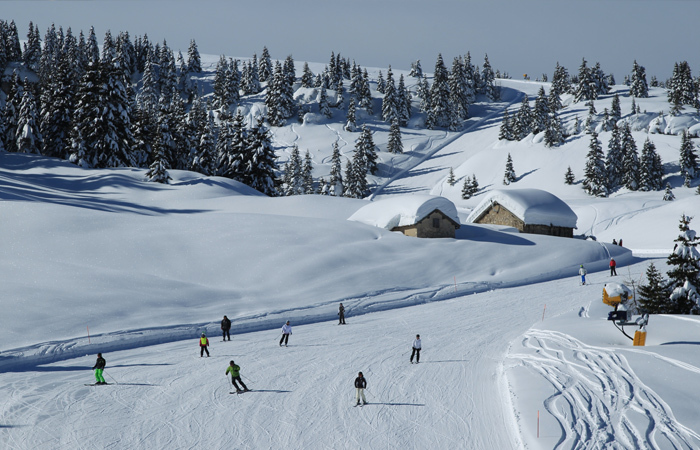 Paganella offers plenty of activities to keep visitors busy, from night skiing to ice skating and ice climbing. If you’re looking for something a little more relaxing, soak up the enchanting Italian atmosphere on sunny terraces or in cosy bars, enjoying local food and wine. Paganella is also the official European training centre for the Norwegian Alpine Ski Team, with Olympic and World Ski Champions regularly practicing in resort, so keep a look out as you might find yourself sharing a chair lift with a familiar face! 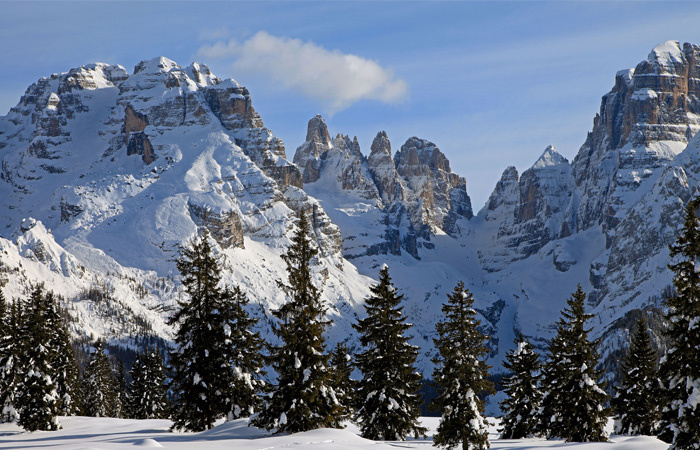 If you’re looking for sure snow in the depths of winter, Madonna di Campiglio is the place to go. There are 150km of pistes, served by a first-class lift system for swift transport to the summits. A 16-minute gondola ride links the area with nearby Pinzolo if you fancy a day trip. The slopes are well attended to, leaving an impressive, award-winning corduroy. Snowboarders aren’t left out: there are four terrain parks to explore – the most challenging of which is Ursus in the Grostè sector. For more snow adventures, they provide tobogganing too. The resort itself is hip and stylish; it was the haunt of the Habsburgs, who were once one of the most influential royal houses of Europe. The quaint, traffic-free village has a couple of five-star hotels, as well as a spa and boutique chalets. Dining in Madonna is also an experience to savour – there are three Michelin-starred restaurants in town and gourmet huts on the mountain. Nightlife here is sophisticated, with a price tag to match. Enjoy piano performances with a cocktail in hand and while away the wee hours at the resort’s sultry nightclubs. Perched in the Alpe Cimbra ski area, this sun-drenched resort is renowned for its scenic tree skiing, which advanced thrill-seekers should pop at the top of their to-do list. The pistes cover an area of 100km and feature snow-making facilities, so it’s a great choice for both the beginning and the tail-end of the season. Despite having the first ever ski lift in Italy, the resort is yet to be discovered by the masses. It’s a quiet spot, so it makes a good base for those learning the ropes too. 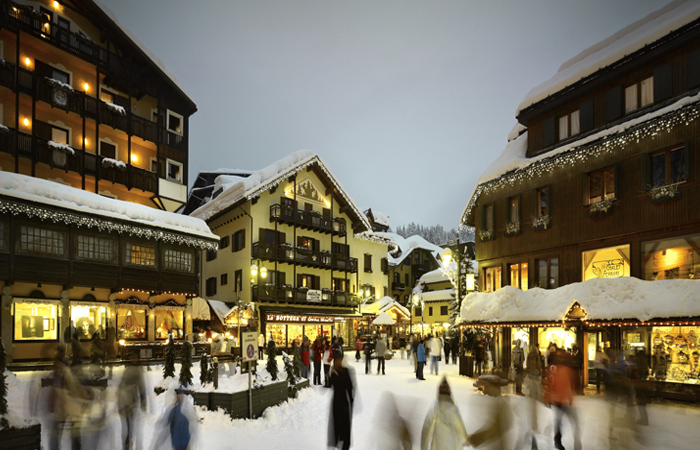 Groups can settle themselves in the pretty pedestrianised village, where English is rarely spoken, and enjoy a spot of people watching when not on the slopes. There’s a strong emphasis on heritage at this resort, which is reflected in the après scene. You won’t find outrageous parties here, but instead, hearty dining and bars that are perfect for lounging. The mountain huts are family-run and serve food that draws heavily on the surrounding area: mushrooms, cheeses and honey. In town, you’ll find pizzerias as well as gelato shops where you can indulge your sweet tooth.